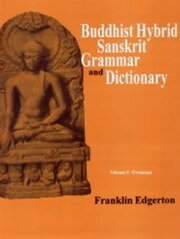 This is the first attempt at a description of the grammar and lexicon of Buddhist Hybrid Sanskrit. Most North Indian Buddhist texts are composed in it. It is based primarily on an old Middle Indic vernacular not otherwise identifiable. But there seems reason to believe that it contains features which were borrowed from other Middle Indic dialects. In other words, even its Middle Indic aspects are dialectically somewhat mixed. Most strikingly, however, BHS was also extensively influenced by Sanskrit from the very beginning of the tradition as it has been transmitted to us, and increasingly as time went on. Many (especially later) products of this tradition have often, though misleadingly, been called simply 'Sanskrit', without qualification. In principle, the author has excluded from the grammar and dictionary all forms which are standard Sanskrit, and all words which are used in standard Sanskrit with the same meanings. "This is a pioneering work dealing with the description of the grammar and the lexicon of Buddhist Hybrid Sanskrit (BHS). Most of the Buddhist texts available in North India are based on it. It is based primarily on an old Middle Indic vernacular not otherwise identifiable. It contains features which were borrowed from other Middle Indic dialects either originally or in the course of historic development or both. In other words, even its Middle Indic aspects are dialectically somewhat mixed. However, Buddhist Hybrid Sanskrit (BHS) was also influenced extensively by Sanskrit from the very beginning of the tradition as it has been transmitted to us and increasingly as time went on. Later many products of this tradition have often, though wrongly been called "Sanskrit" without any bearing. "The most striking peculiarity of this language is that from the very beginning of its tradition it was modified in the direction of standard Sanskrit, while still retaining evidences of its Middle Indic origin, in all its texts, even the oldest, as shown by our manuscripts and editions. "Sanskritisms are constantly presented check by jowl with Middle Indic forms, and often with hybrids which strictly are neither one or other. These Sanskritisms are much too common to be comparable with stray Sanskrit loan words or loan forms which may have been occasionally adopted in many genuine Middle Indic vernacular.